No, Max! Rocks don’t go in the scones! 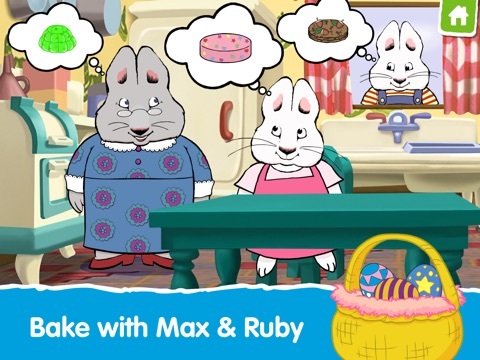 In Max & Ruby’s Bunny Bakeoff kids head to the kitchen with Max, Ruby, and their grandma to bake up some delicious goodies. 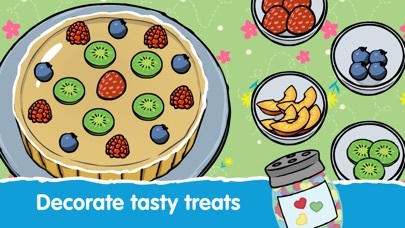 From making scones to churning their own ice cream, kids will get the chance to put their cooking skills to the test. Of course, when Max is involved, there are guaranteed to be a few surprises along the way. Whether it’s suggesting kids add rocks to the scones or offering up a delicious mud pie, Max has plenty of silliness to contribute to the process. The app opens with a developer video that kids can skip by simply tapping the screen. From there, they can decide whether to start baking or get painting. Kids will find both sections easy to navigate. 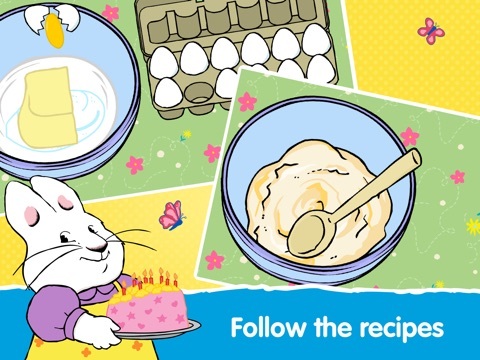 Clear instructions will guide kids through the recipes in the cooking section and reward them with positive praise for a job well done. 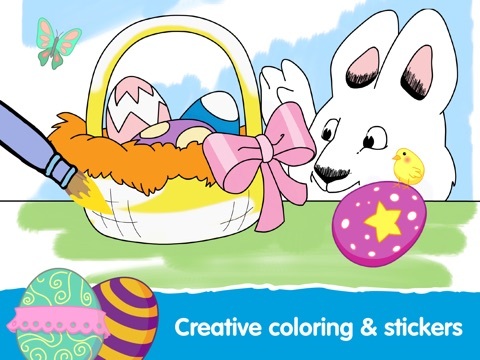 In the painting section, kids will find a series of Max & Ruby-themed coloring pages and easy-to-use tools. 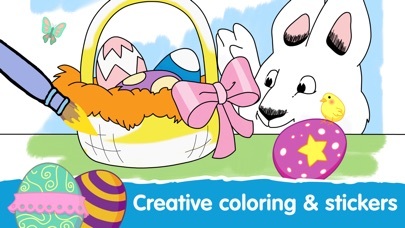 The colors stay in the lines within the picture too, making it easy for little fingers to color the picture exactly the way they want. 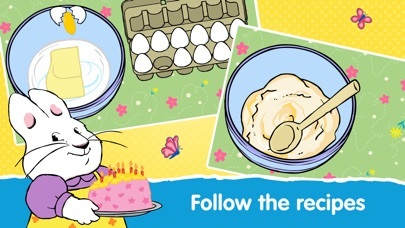 While not extremely advanced, the baking section of the app helps teach kids about following a recipe. When kids decide what to make, they follow a series of steps to help them add all of the ingredients and properly prepare the food. 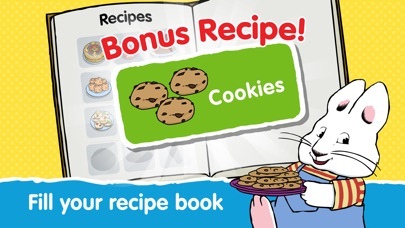 While none of the measurements are exact (when told to add a little bit of milk to make ice cream, for example, the game adds more than “a little”), the game still introduces kids to cooking terminology, such as a cup, a pinch, mix, and stir. Kids get to use different kitchen tools too, such as a cheese grater when making pizza and an ice cream churn while making fresh ice cream for Max. 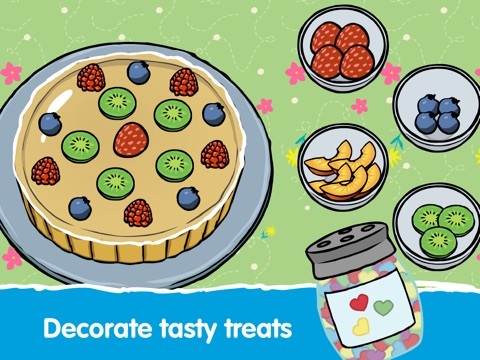 Kids will have fun following the recipes to make scones, pizza, fruit tarts, ice cream cones, and a whole host of other foods. They’ll also love Max’s antics throughout the process. 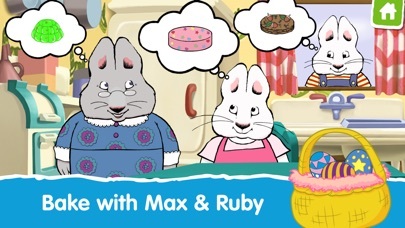 For example, Max frequently suggests they add rocks to the food. He also regularly appears with mud pies and suggests kids make disgusting treats of their own. While fairly standard, the coloring pages are also fun for kids. They’ll particularly enjoy the ability to add fun stickers to each of the pages. 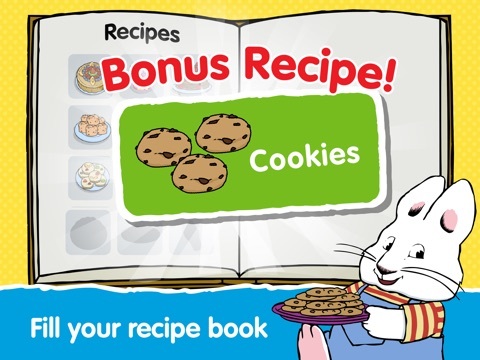 From the different color pages to the wealth of recipes kids can make with Max and Ruby, the app is a good value. Kids will come back to it again and again to see what else they can make. On the main screen, kids can tap on the More Apps button to see all of the other apps Cupcake Digital offers. Access to the apps is protected by a parental lock, but it won’t stop kids from begging for new apps. Beyond that, the app is very child friendly. 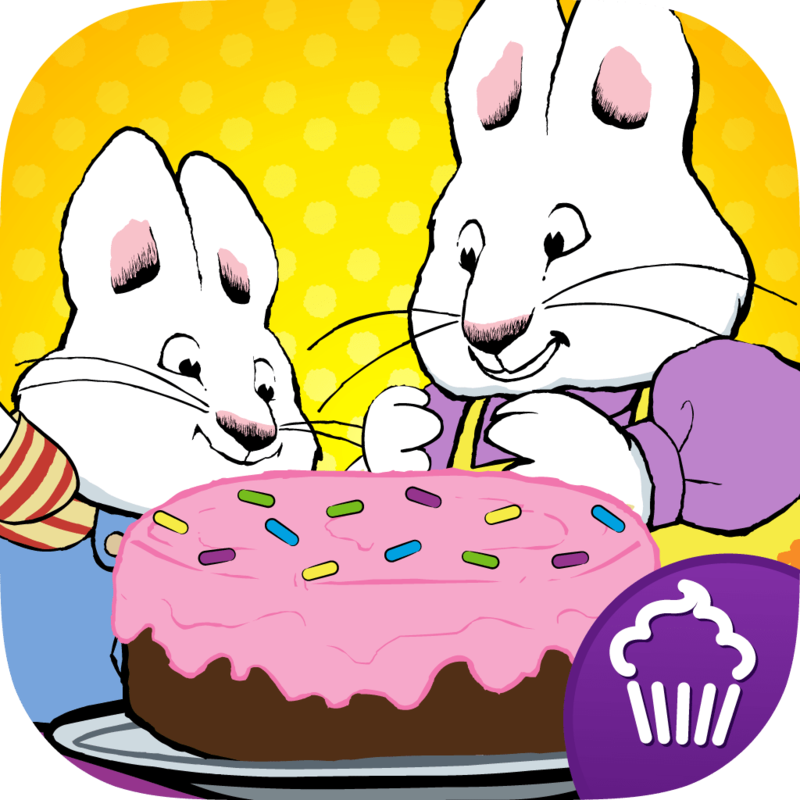 It’s easy for kids to get into the games and to start enjoying baking or painting with Max and Ruby.